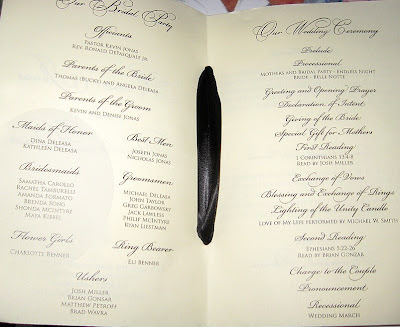 The True Gossip Home / kevin danielle deleasa jonas wedding married photos dress program menu reception best men bridesmaids groomsmen nick joe / KEVIN AND DANIELLE'S WEDDING MENU AND PROGRAM- PHOTOS! KEVIN AND DANIELLE'S WEDDING MENU AND PROGRAM- PHOTOS! 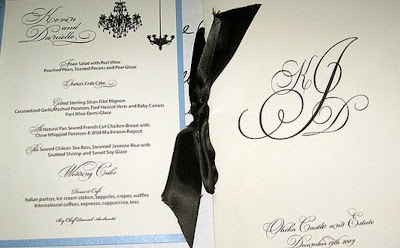 We found photos of Kevin and Danielle's wedding program and menu. The Pastor for the wedding was Kevin Jonas Sr. Bridesmaids included Brenda Song and Maya Kibble. Groomsmen included John Taylor, Greg Garbowsky, Jack Lawless and Ryan Liestman. The Best Men were Joe and Nick. The Maids of Honor were Dina and Kathleen Deleasa. Kevin and Danielle Jonas gave People Magazine permission to release additional information about their wedding in their upcoming issue. The issue will be released to the public soon. 2 Responses to KEVIN AND DANIELLE'S WEDDING MENU AND PROGRAM- PHOTOS! if brenda song was a brides maide then does that mean that she and joe are going out? hmmmmm...... cas brendas joes date and mayas nicks?